Set in December of 1924, a senior editor at Healcroft House, Frank Selby, turns up dead in his apartment. Problem is, his secretary, Kathy Briscow, never mentioned that he hadn't been at work for the previous three days. Seems he only came in when he wanted, and since Kathy was doing his work for him, it didn't matter. But now, Kathy is the main suspect in his murder. Author and socialite Freddie Little finds out that Kathy has been editing his novel, and not Selby. Freddie also has reason to suspect someone else. So he convinces Kathy to work with him to find the real killer. Together, the two comb the streets and speakeasies of New York City to find a killer with an obsession. 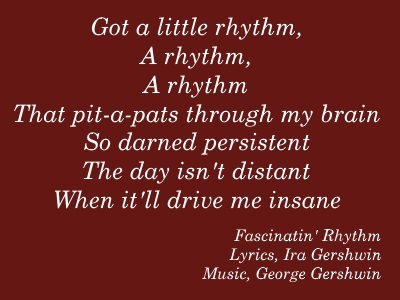 Fascinating Rhythm is available at the fine retailers below. And if you happen to be in Altadena, California, you can also find the paperback at Hoopla! An Emporium of Good Things. Better yet, if you time it right, I might even be around to sign a copy for you. You can click through to my Talks and Classes page to see a clip of me reading from the first two chapters. Or sign up for the Robin Goodfellow Newsletter below to find out where I'll be next and about all the other fun things I'm doing.